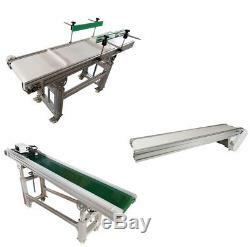 All kinds of conveyor:Length:47.2"/59"/70.8Conveyor Machine. This is mainly used for conveying glass bottles, plastic bottles, bottle caps, metal, plastic bags, paper boxes, cartons, labels, etc. Easy to spurt the code machine, laser machine on production line, printing code, is each brand spurt the code machine, laser machine for spraying, spraying carving production date, batch number anti-fake mark, design must form a complete set of equipment. 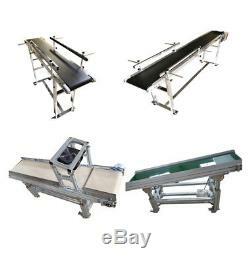 Conveyor can be used to spurt the code machine, can also be used independently, after use will greatly improve the working speed of the workers, save time, save the human power, maximum limit reduces the cost of production. 1 Set of 47.2"L7.8"W Double Guardrail Conveyor 230013. 1 Set of 70.8"L 7.8"W Double Guardrail Conveyor 230014. 1 Set of 59"L 7.8"W Desktop Single Guardrail Conveyor 230019. 1 Set of 59"L 7.8"W Double Guardrail Conveyor 230132. 1 Set of 59"L 7.8"W No Guardrail Conveyor 230133. 1 Set of 59"L 7.8"W Single Guardrail Conveyor 230134. 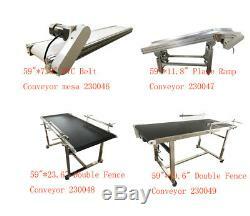 1 Set of 59"L11.8"W High Temperature Canvas Conveyor 230137. 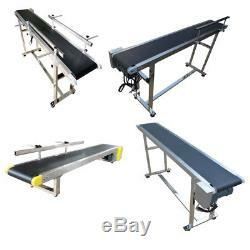 1 Set of 59"L 11.8"W Inclined Wall Type Conveyor 230140. 1 Set of 70.8"L 11.8"W PVC Belt Inclined Wall Conveyor 230030. 1 Set of 59"L 11.8"W Baffle Double Guardrail PVC Belt Conveyor 230031. 1 Set of 47.2"L 11.8"W White PVC Belt Conveyor Mesa 230033. 1 Set of 59"L 11.8"W Double Fence Conveyor 230035. 1 Set of 59"L15.7"W Double Fence Conveyor 230036. 1 Set of 59"7.8" PVC Belt Conveyor mesa 230046. 1 Set of 59"11.8" Plane Ramp Conveyor 230047. 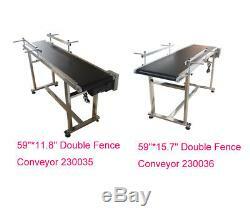 1 Set of 59"23.6" Double Fence Conveyor 230048. 1 Set of 59"19.6" Double Fence Conveyor 230049. 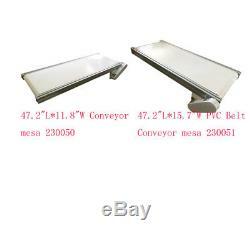 1 Set of 47.2"11.8" Conveyor mesa 230050. 1 Set of 47.2"15.7" PVC Belt Conveyor mesa 230051. Orders are processed from Monday-Friday; Not on the weekends & public holidays. We will work with you to get the case resolved in the fastest method. Please contact with us at first for more details. If product was received damaged or not as described, please send us some pictures or videos, so we could well understand your problem, then solve them for you ASAP. Besides, it's much helpful for us to claim with UPS, remind our related department to pay much more attention to packaging later on. If an item is received damaged, customer service must be contacted within 7 days of receiving your item. ECheck Issues: Payments via eCheck do not clear immediately. Usually you will wait 5-7 days after checkout for it to clear. The item "New A variety of Conveyor Belt Machine, Packaging&Transportation 7.8With11.8W" is in sale since Thursday, December 28, 2017. This item is in the category "Business & Industrial\Material Handling\Conveyors & Conveyor Parts\Conveyor Systems\Other Conveyor Systems". The seller is "wezha-84" and is located in Rancho Cucamonga, California. This item can be shipped to United States.